Set in London in 1992, Feral brings together Matthew (Alex Clarke), an Asperser’s syndrome sufferer and Sebastian (Dani Machancoses), an artist who lives nearby. 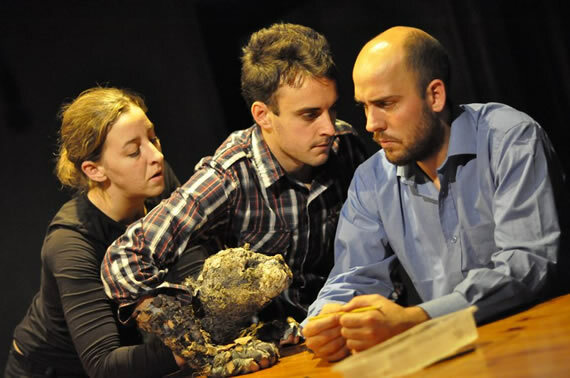 Through the device of a puppeteer (Lowri James) interacting with Matthew as a cat, Toby Clarke’s new play is a valiant effort to understand the human being, the sufferer and his predicament and the misunderstanding of people in general. Matthew wants to be a cat – trying to crawl, jump and investigate the area by sniffing around like a cat. He invites Sebastian, whose paintings he can see from his window, to paint the walls with trees. Matthew knows exactly what he wants but does not understand how to achieve his aim. He is impatient and wants the colour and the length of the branches done quickly and instantly, interfering all the time and stopping the creative work being carried out. It is not because he wants to be difficult, but he cannot help not understanding the process. Matthew is obsessed by keeping the room tidy, keeping the chair in its place, folding Sebastian’s coat and placing it carefully where he thinks it belongs. At one point, there is a ‘lucid’ conversation between them, when Sebastian tries to persuade Matthew to try his hand at sketching and painting. This meets with little success, however, and Sebastian returns to his task. While the work is in progress, Matthew starts acting like a cat and Sebastian tries to tell him to resist the urge and stop it. The play ends with Sebastian’s departure – having completing his paintings, but feeling defeated by not being able to change Matthew, refusing to accept payment. Matthew continues pouncing about like a cat. The lights dim. In researching Feral, writer-director Toby Clarke worked with a child psychiatrist to understand Asperger’s. Those affected may be burdened with a wide range of obsessions. They usually live a solitary life, not by choice, but because they are intimidated by others who cannot comprehend their affliction. This new work is a contribution to breaking down widespread ignorance about Asperger's, celebrate it and treat it as a gift, not as a disease. 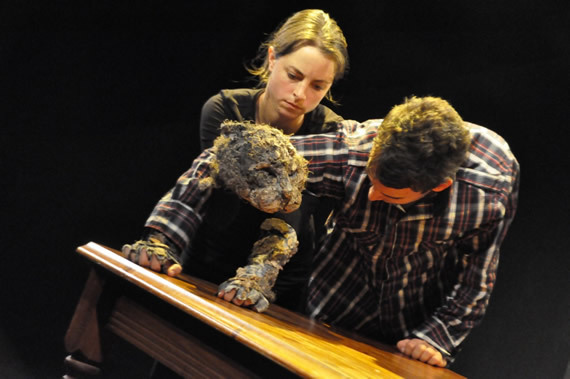 Clarke has drawn moving performances from Clarke and Machancoses, and puppeteer Lowri James interacts convincingly with Matthew, to portray a difficult subject with dignity and understanding. Produced by Simon Beyer, Feral is at the New Wimbledon Studio until 24 October. Box office: 0844 871 7646.